August may be the beginning of the end of the summer season, but you can bet that the high temperatures aren’t planning on taking a vacation anytime soon. While some may use the heat as an excuse to stay inside, others choose to venture outside and bring their furry companions with them. There is nothing wrong with going on adventures with your pets, but if you’re planning on going out into the heat, it’s important that you take your pet’s well-being into consideration. 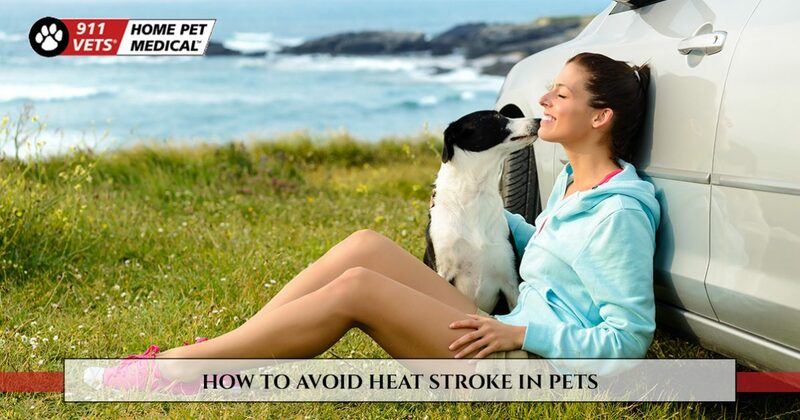 That’s why, in today’s post, we will give you a few tips on how to avoid heat stroke in your pet this summer so you two can stay safe while you have fun in the sun. As a responsible pet owner, you know the importance of taking your dog or cat to the vet for regular checkups, but what if we told you that your visits to the vet could be conducted in your home? At 911 Vets in Los Angeles, we offer mobile veterinary services where we bring all of the services of traditional vet clinic right to your door. Gone are hassles of trying to bring your nervous animal to the vet. Instead, 911 Vets will come right to your home whenever you need. Check out our website to see a complete list of everything that we offer, and contact 911 Vets at 310-341-0216 to request an appointment today! How Is Heat Stroke Defined in Pets? If your pet starts to exhibit any of these signs, it’s vitally important that you call a vet right away and begin the process of trying to cool your pet. You want to gradually bring their temperature down with cool towels in a shady spot. You never want to use cold towels when lowering their temperature because the cold could be a shock to their system. While the cooling procedures may help save your pet, it’s necessary that they are seen and treated by a vet as soon as possible. While it’s important that you keep the dangers of heat stroke in mind, you shouldn’t be terrified of your pet getting heat stroke everytime you go outside. There are plenty of ways that you can enjoy the outdoors with your pet while staying safe and cool. If you do plan to go outside with your pet, try to avoid a lot of physical activity during the hottest parts of the day. Plan your outings for the early morning and evening when the temperatures are mild. Additionally, make sure that your pet has plenty of water and shade when you go outside. Bring along a water bottle and a collapsible water dish so that you can provide your pet with water on the go. If you really want to plan a fun, cool outing, try going to the beach! Your pet will love splashing around in the water, and you won’t have to worry about them getting too hot. Not to mention, you’ll be able to cool off as well. For those who don’t have easy access to a day at the beach, you can invest in a kiddie pool or even hook up a sprinkler for your pet to enjoy! Planning activities outside is fun, but it may not be something you do every day. Even if you aren’t going on a long walk, hike, or on a trip to the park, it’s still important that you do everything you can to ensure that your dog doesn’t get too hot. Simple tasks like brushing your pet or keep the fan on for air circulation will help cool off your pet and reduce the risk of heat stroke. If you’re not careful, the summer heat can be a dangerous time for your pet. Luckily 911 Vets is here to help. With our mobile veterinary services, we offer everything that you would find at a traditional vet right in your home! Whether you’re in need of an emergency vet clinic or a routine checkup, the experts at 911 Vets have you covered. Give us a call today to schedule an appointment. We look forward to working with you and your pet soon!